Is the Great Cackler His symbol is the goose, earth. Geb is depicted as a man wearing the crown of the North or the South. 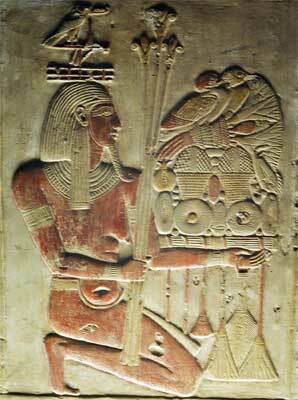 His skin is either dark representing the rich soil of the Nile or green representing the color of Nile vegetation. An interesting story is that God of the earth, Geb’s laugh cause of earthquakes. Geb’s duties as the god of the earth included guiding the dead to the underworld. Considered to be the Father of the gods. His symbol is the running water. Interestingly though a male deity, Hapi is depicted as a man with breasts and a round belly, which indicated nourishment and fertility. Hapi represented both the upper and lower Nile. He had two wives as he represented both the regions. In the north, there was Buto who was depicted as a cobra. In the south, there was Nekhebet who was depicted as a vulture. Among the pantheon of Egyptian gods, Hapi was one of the greatest. Hapi is the oldest of the Egyptian gods whose name is an evolution of the ancient Egyptian word for the Nile, help. According to Egyptian mythology, he was the creator of everything including the universe. He means He who is above. His symbol is a hawk, falcon, bull, Double Crown, Winged Disk, Sphinx, weapons, iron, blacksmiths. Horus was often depicted as a child suckling at his mother’s breast. Horus in his child form is shown in a stunted body. As a result of Horus’ association with the sun, he was often depicted as the personification of the rising sun and a symbol of eternal life and resurrection. As the older Horus, Haroeris, he was depicted as a falcon-headed man wearing the crowns of Upper and Lower Egypt. The ancient Egyptians believed that their pharaohs were the earthbound embodiment of Horus, one of the greatest Egyptian gods. 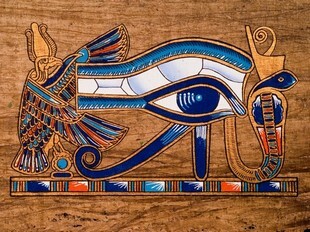 Egyptian pharaohs would take the name of Horus as their own to show their direct relation to him. Her symbol is a throne, kite, Scorpion, sistrum, tiet (the “Knot of Isis”) Depictions of the goddess Isis showed her as a woman wearing the solar disk between a pair of horns and a vulture headdress.Sometimes she is shown wearing the crowns of Upper and Lower Egypt sporting a pair of ram’s horns or the feather of Ma’at. Isis was also depicted as a woman, not a goddess, with a simple ordinary headdress and with a uraeus on her forehead. Isis was the daughter of Nut and Geb and the sister and wife of Osiris. Isis is regarded as benevolent Goddesses and considered to be the mother of all creatures, she is also known for her magic. Interestingly her benevolence resulted in her worship beyond Egypt and as far away as Great Britain. The ancient Greeks associated Isis with Athena and Tethys. In the Egyptian Book of the Dead, Isis is the giver of food and life to the dead.